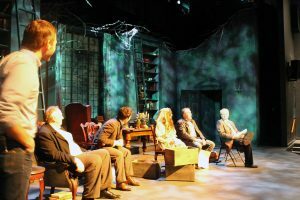 Greg Pocha, of the EPC (far right), speaking on stage at the Vertigo Theater in Calgary, Alberta after the Forensic Friday presentation of “The Haunting”. He is seated with the cast and stage director. These services are free of charge! The Eidolon Project Canada Parapsychology, Afterlife, and Paranormal Studies Org. exists to Research, Investigate, and Educate. The EPC is available to speak to your group upon appointment. Audio / visual presentations may be available as well (we ask that the host has their own A/V equipment). 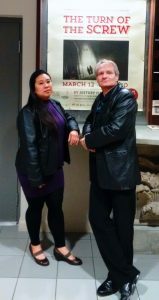 Czar Briones and Greg Pocha of the EPC after speaking at Calgary’s Vertigo Theater’s Forensic Friday production of Henry James’ play, Turn of the Screw. Greg Pocha, the EPC’s Director of Parapsychology, Afterlife and Paranormal Studies is extremely well educated in his field. He has taught classes in Paranormal Study (Metro / Edmonton Public Schools), presented programs at Edmonton Public Libraries and remains the Top Expert on the world’s largest Question/Answer web-site –AllExperts– in the categories of ‘Ghosts and Hauntings’, “Death, Dying and Beyond” and ‘Afterlife and Near Death Experiences’. He has been interviewed by the Calgary Herald, the Red Deer Express, and the Beaumont News. He has been asked and has contributed to several web blogs. He is the guest speaker at Calgary’s Vertigo Theatre for their Forensic Friday Mystery series. Greg is also a leading authority in ‘Spectral Profiling’. Greg is happy to come to your function or event to speak It is not unusual for more than one speaker or presenter to show up. There are no charges for this! The EPC asks that you make your booking at least 6 weeks in advance of the date that you would like the presentation. If you wish to have Greg show up at your event to speak please pick a field from the list below. The default theme is “Ghosts, Hauntings and Paranormal Activity (General))”. Theme 2 – Near Death Experiences (General). Theme 3 – Beyond the Horizon – Life After Death. Bookings can be made by using Contact Form 2. If you wish to interview Greg Pocha, please contact him using Contact Form 2.